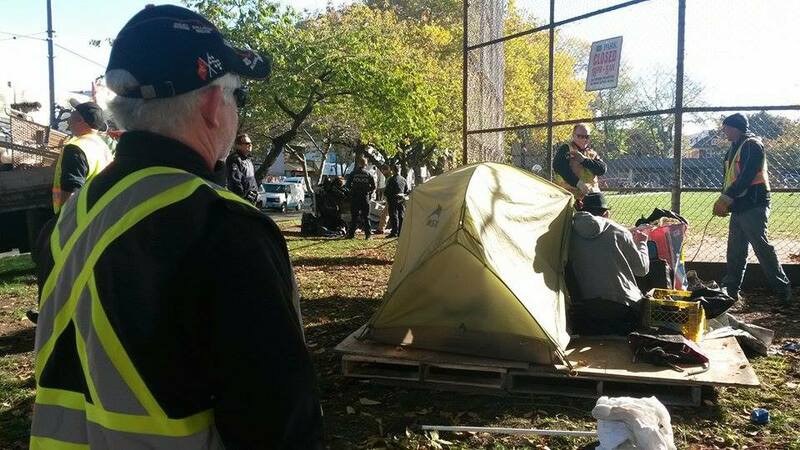 This morning, the City’s of Vancouver’s annual Homelessness Action Week took on a new sinister meaning when eight police officers and a dozen city workers dismantled and displaced the homeless camp in Oppenheimer Park. Yesterday there was over 20 tents in the park, and today by noon none were left. One man who was being evicted said he had pneumonia and was in pain and coughing while the city workers dismantled his tent. He said Carnegie Outreach had a “viewing” at an SRO hotel for him but he was afraid to leave his stuff to go. Even if he did go, outreach workers said there was no guarantees he would get the room. While talking to him, city worker pulled stuff from his tent and filled 2 garbage cans. Having lost all his belongings, the man walked off wearing just a t-shirt and cotton shirt over it. Another man, Cameron, said he had been staying in the park for over 3 weeks and said he didn’t know where to go next. He said was supposed to have a mental health liaison worker who was supposed to help him find a place to live but she had not been in touch. While city workers were displacing homeless people in Oppenheimer Park, the United Gospel Mission was having a press conference a few blocks away to release their new housing report, “No Vacancy: Affordability and Homelessness in Vancouver.” According to the report, virtually every indicator points to an increase in homelessness and housing insecurity in Metro Vancouver, both now and in coming years as a result of structural factors, beyond an individual’s control. The report shows how homeless people have literally nowhere to go. The UGM turned 1,545 people away in the first nine months of 2016, up from 1,251 during the same period last year. The hundreds of people who are turned away from shelters often have no other option then the street, but when homeless people set up tents and tarps in city parks, under bridges or any other place they can find, they are told by the police and by-law officers that they cannot stay there. And when people refuse to leave because they literally have nowhere to go, the police along with city workers dismantle their tents and throw away their belongings. The UGM report highlights that the investment in social housing over past few years has not proportionate to the need and concludes that unless significant action is taken to address structural factors, homelessness will continue to impact a growing number of individuals and families in Vancouver. However what is missing from the report is the role that municipal policies plays in exacerbating this unprecedented housing crisis by criminalizing people for being poor and homeless. Homeless people have no option but to sleep outside, but when they do, they face constant harassment and displacement by city workers. The City of Vancouver’s policy to displace homeless camps breaks up networks of mutual support and care, pushes homeless people into isolation and unsafe places, and taken together makes homeless people’s daily struggle for survival more difficult. Vacancy rates for most affordable rental units are below 1% across Metro Vancouver. While there are 42,171 permanent subsidized housing units in Metro Vancouver and new units have been added yearly, 10,278 households remain on BC’s Housing Registry, seeking suitable housing. Between 2010 and 2015, the average rental price of bachelor units in Metro Vancouver increased by 16%. ncome assistance has not increased in 9 years while average market rent has increased every year since 2010. The number of people housed by homelessness outreach programs has increased over the past five years. The percentage of women in shelters has grown from 28% in 2011-2012 to 32% in 2015-2016. The number of senior applicants on BC’s Housing Registry has increased 38%.